We’d love your help. 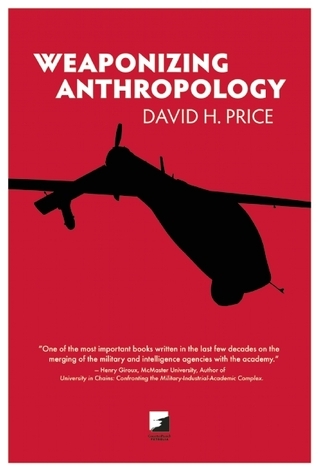 Let us know what’s wrong with this preview of Weaponizing Anthropology by David H. Price. The ongoing battle for hearts and minds in Iraq and Afghanistan is a military strategy inspired originally by efforts at domestic social control and counterinsurgency in the United States. Weaponizing Anthropology documents how anthropological knowledge and ethnographic methods are harnessed by military and intelligence agencies in post-9/11 America to placate hostile fore The ongoing battle for hearts and minds in Iraq and Afghanistan is a military strategy inspired originally by efforts at domestic social control and counterinsurgency in the United States. Weaponizing Anthropology documents how anthropological knowledge and ethnographic methods are harnessed by military and intelligence agencies in post-9/11 America to placate hostile foreign populations. David H. Price outlines the ethical implications of appropriating this traditional academic discourse for use by embedded, militarized research teams. To ask other readers questions about Weaponizing Anthropology, please sign up. A great summary of the current attempts by the US military to appropriate the skills, methods and theories of anthropology, and of the sometimes flawed reactions to these moves from within the discipline. An important book. Price's is a readable, well-documented and necessarily critical documentation of a number of instances where the object of 'culture' becomes taken up by the predominantly US military machinery. This involves a set of critiques of various pseudo-academic programs increasing military's presence on the campus, but also its ways of trying to recruit anthropologists particularly and human scientists generally for its own objectives. Price gives detailed critiques of the Counterinsurgency Field Manual Price's is a readable, well-documented and necessarily critical documentation of a number of instances where the object of 'culture' becomes taken up by the predominantly US military machinery. This involves a set of critiques of various pseudo-academic programs increasing military's presence on the campus, but also its ways of trying to recruit anthropologists particularly and human scientists generally for its own objectives. Price gives detailed critiques of the Counterinsurgency Field Manual, programs such as the Human Terrain Teams, while not hesitating to take on subject matters such as the crude use of anthropology in the movie Avatar, as well as sets of biographies of failures to comprehend what Price sees as anthropology's generally accepted disciplinary ethical standards. So far, so good. Where I see this book as specifically lacking is its residual methodological grounding in the state/culture distinction, sometimes reeking of the feeling that it is in particular the state's presence and abuse of institutions such as science, that would otherwise work. Doesn't this in ways border on the neo-liberal sentiment that the problem is too much state, repeat over and over? This is certainly not to say Price is politically naive, far from it. But vis-à-vis other critiques of the liberal war, it is hard to ignore the co-existence of modern scientific knowledge (including the humanities) alongside the practices of organisation and, you guessed it, war. I have in mind the particular comfort Price makes through drawing a quite clear boundary between politics and ethics. Their relationship is complicated, historically, culturally and topologically specific and in particular vulnerable to the Foucauldian problematization through the power/knowledge nexus, as well as Foucault's specific questioning whether it is possible to set up knowledge practices that would escape the pathologies of liberal configurations of the politics/ethics/security mechanism. Important information presented in a somewhat dry read riddled with typos, yet nonetheless compelling for its insights and points of concern regarding the American military and its relationship to the human sciences. A little repetitive, especially in the later chapters, but it (or at least portions of it) should be required reading for any kind of anthropology graduate training. An excellent compendium of information and analysis. Could have used more proofreading.